Before you leave home be sure to provide your trip details to a trusted person who can then give that information to the authorities if you are overdue. This offers dual benefits — if you do become injured or lost you’ll be less likely to panic and do something dangerous, and you’ll be rescued more quickly. You'll likely have only a simple, but memorable, misadventure instead of a tragedy. Witness the well-published story of Aron Ralston, who had left unannounced on a solo hike, and ultimately had to amputate his right arm after five days of being pinned to a canyon wall. The most important tool in a survival situation is your mindset. More than anything else, your state of mind will likely determine your chance of survival. Sometimes it’s hard to accept the fact that you may be lost. Whether because of embarrassment or the inherent discomfort of not knowing exactly where you are, it’s not uncommon for people to initially deny that they are lost and alone. If you become lost, it is very important to stay calm and look at your situation realistically. Remember of the acronym S.T.O.P. Stop, Think, Observe and Plan. Sit down, calmly review your situation, assess your surroundings and your supplies, consider the specific priorities for your environment and plan a course of action. The Rule of 3 is only a guide, and there are exceptions, depending on your environment as well as your physical condition. But it does serve as a reminder of the usual order in which survival tasks should be performed. In addition to the general items that hikers should carry — snacks, water, rain gear, sunglasses, etc. — remember to also include a survival kit that will help you to survive an unexpected night or two in the wilderness. Remember that when purchasing survival gear, buy good quality, reliable gear. Cheap, poorly made gear is sure to fail just when you need it the most. Staying dry is important. Moisture accelerates heat loss and increases the possibility of hypothermia. Be sure to pack rainwear when hiking and consider including a compact, ultralight towel in case you inadvertently get wet. Survival blankets and bivvys are available in several sizes and thicknesses. All are designed to reflect body heat , keep you dry, and help block the wind. Survival blankets are inexpensive, lightweight, and multi-purpose — they can also be used to help collect water, treat shock, as a tarp, as a ground cloth, a poncho, and as a signaling device. Building a fire provides heat, light, acts as a companion, can help purify water, cook food, signal for help and more. However, unless you have experience, building a fire is not as easy as you might think. It is especially difficult in wet and cold conditions which, of course, is when you need a fire the most. Practice fire building, with the fire starting tools in your kit, before heading into the wilderness. Of course, only build a fire if it is safe to do so. Dry, windy conditions can quickly turn a wayward ember into an inferno. A first aid kit can help prevent minor injuries from turning into major events. Medical kits designed for outdoor use have been configured to accommodate a specific number of hikers for a specific duration. These kits are available in many sizes from ultralight solo kits to large group kits for trained responders. Each person should have a personal medical kit, preferably waterproof, and a guidebook or instructions for easy reference in the field. In addition to the usual assortment of dressings, medications and supplies, be sure to include an elastic bandage for sprains, forceps for ticks, blister treatment, and bite and sting medications. Staying hydrated is critical to survival. Proper hydration allows your body to better thermoregulate (even in cold weather), allows you to stay mentally alert, helps your body to digest food, and helps alleviate hunger. It’s important to make the available water safe to drink by boiling, filtering, or purifying. There are a number of products that can be used to make available water safer: metal cups for boiling, chlorine dioxide tablets, UV light purifiers, and microfilters. Even if you cannot treat your water, hydration is so important that it’s usually better to drink untreated water than not to drink at all. Food, although not the top priority, is important. Food fuels the body and comforts the mind. Bring enough food for the duration of your hike plus extra food — just in case. Unless you are trained in identifying natural plants, it can be counter-productive or even dangerous to graze on the landscape. Of course, if you have the time and means, it’s certainly alright to fish or gather foods that you’re certain are safe. Signaling expedites your rescue by alerting searchers or fellow hikers to your current location, and the ability to call attention to yourself is especially important when injured. A signal whistle is small, light, and inexpensive, can be heard from a great distance, and is the best way to signal ground searchers. Everyone should have a whistle on their person at all times, especially children. A signal mirror is a good way to signal both aircraft and distant ground searchers. Cell phones are great — when they work. Often there is no cell reception in the backcountry areas that hikers frequent. PLBs (Personal Locator Beacons) are becoming smaller, less expensive, and offer an extremely reliable way to request help and mark your location, even in very remote areas. A knife is often the first thing that people think of when discussing survival. And, in fact, it is a very important tool. Generally this is because a good knife will help you construct a shelter, prepare firewood and food, improvise other tools, and more. It is rarely needed to hunt or be used as a weapon. In most cases it is not necessary, or desirable, to carry an overly large knife. A strong, fixed blade knife with a 3”-5” blade will handle most survival tasks. Additionally, a folding knife or multi-tool makes a good adjunct to the primary knife and is better suited for detailed tasks. A flashlight or headlamp with extra batteries will help you stay safe in the dark, allow you to explore the unexpected cave or crevasse, render first aid at night, and serve as a signaling device. Make sure to choose a light with an LED lamp to provide the most durability. Lithium batteries offer the best combination of shelf life, cold weather performance, and light weight. Is survival gear really necessary? Hopefully not. But you’d rather have it and not need it than vice versa. It’s also quite possible that someone with you, or someone that you might encounter, may require your assistance. Complacency in the wilderness can quickly turn deadly. There are plenty of lost hiker stories that begin with, "I never thought that it would happen to me…" or, "It was a short hike, but I got separated from the group…" or, "We took a wrong turn and…" or, "The weather wasn’t supposed to…" and many of these stories have tragic endings. Being prepared isn’t difficult, can actually be fun, and gives you the confidence to better enjoy the backcountry. 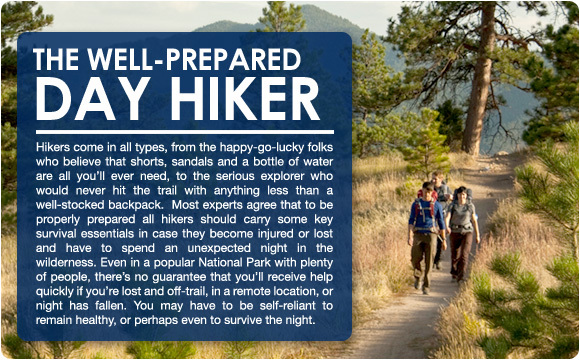 Click on the link below for a printable Hiker's Checklist that you can use to make sure you've prepared as well as possible before you begin your next outdoor adventure.